September marks the beginning of autumn, one of our favorite seasons. Each autumn, we head out to orchards on the weekends and fill our baskets full of nature’s fruit. It’s refreshing to be out in the crisp, fall mountain air. Could there be a more perfect autumn ritual? 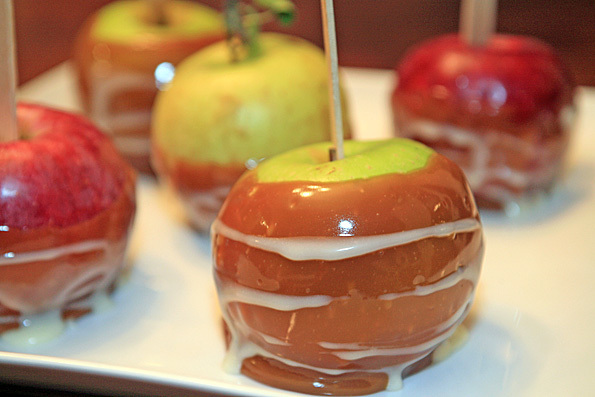 We decided to do something fun with some of our apples and created these Sticky Caramel Apples. They’re not difficult to make and they’re a big hit with the kids! Insert a popsicle sticks into the bottom of each apple. Using the method of a double boiler, melt caramels – place water in a small sauce pot and bring to a bowl. Find a metal or glass bowl that fits over top the pot. As the steam rises from the boiling water, it will melt the caramel. Once the caramel is melted, turn off the burner and add in the 1 oz. of cream and a pinch of salt. Whisk to combine until the mixture has a silky sheen. Dip apples into caramel, coating three-quarters of each apple. Let excess drip off and scrape the bottom of the apples against the side of bowl. Transfer to a baking sheet lined with wax paper and allow to set. Using the same method as above, melt white chocolate and stir until smooth. Fill a small a piping bag with chocolate. Hold the caramel apples horizontally. While spinning the apple, drizzle with chocolate in a back-and-forth motion. Return to baking sheet, and let set for about 30 minutes.